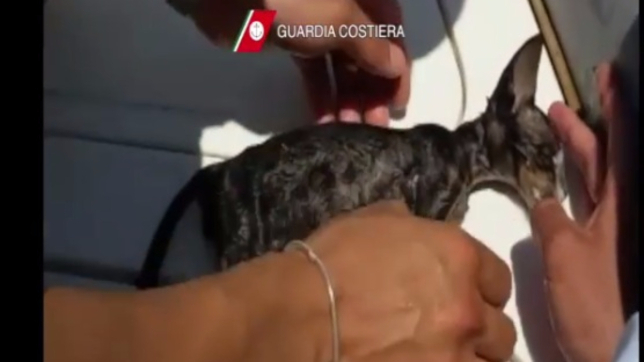 Italy, Marsala – A kitten has been saved by coast guard at the harbour of Marsala (Trapani), while it was about to drown. The crew rescued the cub, carrying it out of the water and practicing a CPR. After a few minutes of compressions, the kitten started to expel water and to meow weakly. It is alleged, that a group of children saw the cup in the sea water and the situation attracted coast guard crew on a boat. They tried to practice the CPR they usually practice on human beings, and they managed to save the cub. Then, Charlie – how the crew called it – has been treated by a vet and has been adopted by coast guard. Although most cats do not choose to go swimming, they are capable swimmers nonetheless. Drowning and near drowning usually results when a cat falls into water and cannot find a place to climb out. Finding your cat swimming or (worse) floating in water will be upsetting, but do not put yourself in danger when rescuing your cat. Remember, if your cat is conscious, he will grab whatever he can with all his claws, including you. A fishing net on a pole or a pool skimmer may work to scoop your cat out of the water. Alternatively, a flotation device that your cat can hold on to may allow you to get your cat to a place where he can safely be removed from the water. Once your cat is out of the water, the first thing to do is check for breathing and heartbeat. Rinse him off with clean, warm water. Dry him as best you can. Keep him warm and observe him for signs of shock or hypothermia. Call your veterinarian in all cases, and bring your cat to the doctor if there seems to be any problem. Hold him upside down by the hind legs for a minute to facilitate draining water from his lungs. Begin artificial respiration and/or CPR, but still try to keep his head lower than his hips so water may continue to drain. Once he is breathing okay, towel him dry quickly, then wrap him in dry warm towels. Take him to your veterinarian immediately. Your veterinarian will want to examine your cat for shock and hypothermia, as well as evaluate his heart and lungs. X-rays of the chest may be necessary. Your cat may need to be put on oxygen if he continues to have problems breathing. He may also need to be placed on intravenous fluids and warming blankets to treat shock and hypothermia. Until your cat is stabilized, he will be kept in the hospital. Once your cat is back home, it is important to keep him inside and monitor him for several days. If he aspirated any water, he may develop pneumonia a few days later. Most fencing that is placed around pools to keep children out will not keep a cat out. Be sure that there is someplace where your cat can walk out of the water should he fall in, or do not let him out at all. The same holds true if you live near a lake or river. If your cat likes to go boating with you, find a personal flotation device for cats, and get him used to wearing it. Water hazards exist inside the home, too. Cats, and especially kittens, could land in anything filled with water (bathtub, sink, toilet, bucket, etc.) and drown.